No matter how hard we try to stick to main meals, only have one or two glasses of fizz, when the festivities are in full swing we so often fail….. the result is an extended waistline with discomfort, feelings of nausea and at worst bum wind!!! The little black dress looked stunning as you left for the party and four hours later you cant wait to get into your PJ’s and set your belly free! Yet the following morning you will be paying the price for that extra mince pie, two bottles of pink fizz and whatever else grabbed your attention….. So you need to prepare in advance, you need to boost your happy gut bacteria so they are working at optimum levels before you indulge. 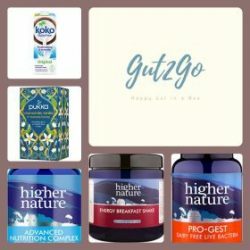 The Gut2Go Box contains products that help you create a happy gut through boosting your bacteria. You can read more about the contents here.